Where little has changed since the expedition crossed this ancient trail. Experience why Lewis & Clark described this area as the most challenging yet majestic portion of their journey. We’ll visit sites along the trail where they endured great hardship like Wendover Ridge and Snowbank Camp or the “inexpressible joy” on Spirit Revival Ridge. The Lolo Trail is a high mountainous ridgeline trail that allows you to see where the expedition came from and brings to light the decisions they faced. You will have the opportunity to explore Lewis Clark camps rarely visited in the last 200 years like 13-Mile, Sinque Hole, Lonesome Cove and many more. We offer hiking, biking and walking tours ranging from 1-day to 5-day adventures, novice to advanced. Sept 15-19 – The ultimate Lewis & Clark Lolo Trail Adventure retracing the expedition’s exact route on the exact dates. The Lolo Trail was the northern route across the rugged Bitterroot Mountains used for centuries before Lewis & Clark by Native Americans of the West. The Nez Perce traveled east to the Great Plains and the buffalo. The Salish used the trail to reach the Lochsa river and fish for salmon. After Lewis & Clark found the headwaters of the Missouri and crossed the Continental Divide at Lemhi Pass they scouted the Salmon River as a possible route to the Pacific. Upon realizing that route was not viable they followed the Bitterroot River towards the Missoula Valley. 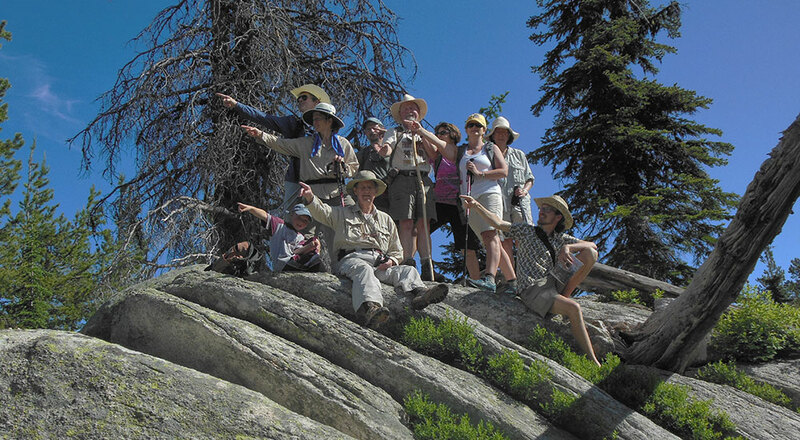 With their Shoshone guide, Old Toby they chose the Lolo Creek drainage to Lolo Pass. This is where our trips begin. 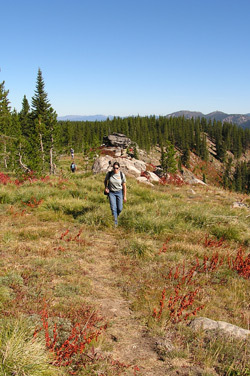 All Lolo Trail trips are based on or near the old Forest Service Road 500 or “The Motorway”. The motorway is a rugged jeep trail that follows the ancient trail. Built by the forest service and CCC crews from 1930-1935 during the FDR administration, not much has changed since then. The Forest Service, outfitters and private citizens work to clear the trail each summer from downed trees and snowmelt that can easily stay into July. The history of this ancient route, it’s primitive state, and vast beauty are what make the Lolo Trail such an incredible place and authentic Lewis & Clark experience. Unlike other trails built for recreational purposes to reach mountain tops or alpine lakes, the Lolo Trail evolved out of function. Gary Moulton describes the Lolo Trail as a “route of opportunity”. From Lolo Pass to the Wieppe Prairie the trail follows a general direction of east—west from meadow to meadow, watering hole to watering hole for human and livestock survival. Our goal is to visit the most historically significant and scenic points. We provide a quality outfitted camp with canvas tents for doubles and dome tents for singles, cots, deluxe sleeping pads with 2″ foam core, chairs and commercial outfitter kitchen. We provide hearty & healthy food prepared fresh on the trail, gourmet camp cuisine. We practice leave no trace camp ethics, our toilet is set up at each camp. It’s clean, convenient and discreet. Due to the lack of water along the route, we haul all drinking water and enough for washing up hands and face. Please feel free to ask questions regarding camp or personal hygiene. Wendover Ridge is a pivotal point in the journey across the rugged Bitterroot Mountains. Instead of staying high on the ridgelines at Lolo Pass, they mistakenly followed a fishing trail to the Kooskooskee (Lochsa River) meaning rough water in Nez Perce. After a cold night along the banks of the Lochsa River, Lewis & Clark awoke to the realization that they needed to climb up and out of the river canyon to the ridgelines above. The trail begins with a 2 miles of swithbacks then follows the ridgeline for 6 miles. It climbs approximately 3000 vertical feet from the Lochsa River to Snowbank Camp. This trail climbs steadily and really gives you a feel for the difficulties the expedition faced. This trip does not require any technical skills but we recommend you are in good physical condition, have previous hiking experience climbing in elevation and the desire and determination to reach the top! If others in your group want to see the Lolo Trail but not climb Wendover Ridge an alternative itinerary can be planned with historical interpretations and both groups will meet at camp to share their stories of the day. Wayne Fairchild, founder of Lewis & Clark Trail Adventures (LCTA) started exploring this area during the early 1980’s while working at the Lochsa Lodge and attending the University of Montana School of Forestry. Upon graduating he started LCTA and ran biking and hiking trips on the Lolo Trail. Through his extensive knowledge of the area and its history you will find rarely visited sites, learn the historical significance, and participate in thought provoking dialogue. We invite you to explore the Lolo Trail with us! Let us know your preferred date. Group minimum of 4 participants or paying for the equivalent. Trips meet from Lochsa Lodge in Powell, ID. Our stops focus on Lewis & Clark campsites and other significant sites mention in their journals. Some thickly wooded near watering holes and some are along the open ridge line with mountain views for miles. Every stop includes full historical interpretations plus discussions while driving. This is a time efficient itinerary allowing optimal scenic vistas of the Bitterroot Mountains, L&C + other historic sites and camps with some single-track/off-road hiking totaling about 4 miles. Stops and hike/walks include Indian Post Office (the highest elevation on the Lolo Trail and incredible view) to Lonesome Cove Camp (9/16/05) interpretive hike/walk, Sinque Hole Camp (9/17/05) to Indian Grave to Smoking Place interpretive hike. Trip and stops are subject to change based on weather or road conditions and a group’s ability and expectations. Missouri River Canoe & Lolo Trail hiking Combo trip – 6-Day with a free travel day in between. Hiking & Biking trips are vehicle supported. However, trips can be planned according to a custom schedule as long as we have availability. Lochsa Lodge 208-942-3405 is the recommended lodging location for Lolo Trail trips. "I have been wet and cold in every part as I ever was in my life, indeed I was at one time fearfully my feet would freeze in the thin mockersons which I wore"